Give a room a whole new look by simply putting in new wall paneling. Taking old paneling off the wall in preparation for new paneling can be tedious, and removing the glue that binds the paneling to the wall can be arduous. Wall panels are often constructed of metal or wood and are covered with textured fabrics, materials or wallpapers. Fortunately, it only takes a few items to remove stubborn paneling glue from the wall. Remove paneling glue and adhesives from drywall using a few items from the hardware store. Scuff off glue or adhesives on the walls using a paint scraper. Do not scrape too aggressively as this may cause deep gouges and greater damage to the wall. Apply heat directly to the glue with a heat gun or hair dryer set at its highest heat if the glue doesn’t come off. The heat causes the glue to soften. Remove the glue off the paneling using a scraper while applying heat. Continue applying heat and scraping until all the adhesive is stripped off. Remove any remaining glue spots using sandpaper and a circular motion. 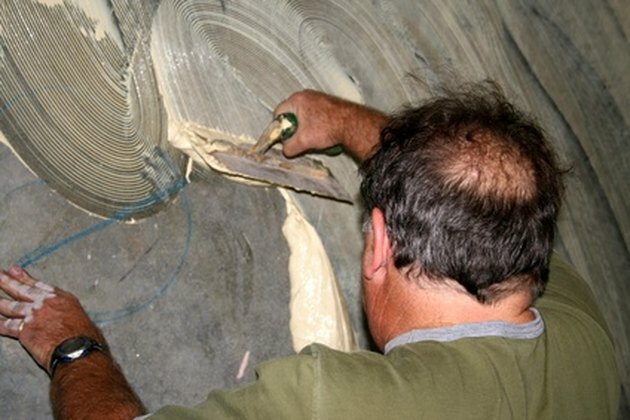 Restore the wall using a mud exclusively made for drywalls. Put mud directly on the wall using a putty knife to conceal holes or scratches that were created while getting rid of the adhesive from the walls. Leave the mud to dry out completely.